So our most esteemed member nfsu360 is still working on tools and ways to make Most Wanted and Carbon modable. This time he managed to put Rockport into Carbon. Not only that, he released a download link on his blog! Feel free to go and try it out for yourself. I have already seen tools being made for it for small fixes which great to see as we are all a community here. nfsu360 has released the Need For Speed: Carbon Mod Tools v1.0. NFSU360 Releasing Carbon ModTools May 12, 2010. Nfsu360 and I have been discussing,and he has expressed to me that he will be releasing his new Modtool package for Carbon on May 12, 2010. 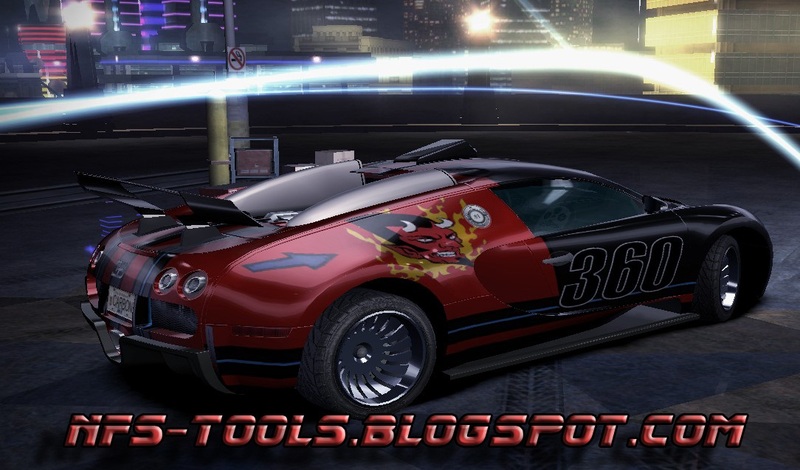 The Modtool package will include the application as a Bugatti Veyron Installer. This tool will install the mod & create backup files automatically. The Bugatti car is fully compatible with NFS:Carbon, with the following supported items. Customization: hoods, roof scoops, spoilers, rims. All Autosculpt features are available. Rims, front bumpers, rear bumpers, skirts, hoods, roof scoops, spoilers, exhaust tips. Other details within the package. NFS:Carbon Geometry Compiler - tool that compiles geometry.bin file from .z3d and .obj files. NFS:Carbon/ProStreet Texture Compiler - create textures.bin from .dds files. NFS-CfgEd for NFS:Carbon - export .carbon files that contain car's configuration. NFS: Carbon Car Setup - this tool is created to make installation very easy. Automatically create backup files for uninstall process. Users can add this program to their own packages. Other big news, nfsu360 has also cracked the Undercover geometry, introducing a tank as the first fully textured custom vehicle. Be sure to visit his website at http://nfs-tools.blogspot.com for all your Modtool downloading needs, as well as any recent updates he provides. Need For Speed: Carbon Geometry finally Cracked. Since the Release of Carbon in October of 2006, Carbon has been locked and virtually unmoddable. Finally after tirelessly working with the code, Dawid, known as NFSU360, solved the equation, and has the ability under his thumb for new user created cars to be imported into the game. The Tool release date has yet to be announced, as well, the performance modding is yet unchanged, so for now, any cars imported would still use the original settings from the one it had replaced. Carbon Modding news will be known when more proper detailed information becomes available from the original source. There are only three source shots of this current NFS success. EA released patch 1.4 for Need For Speed: Carbon. This patch fixes Windows Vista compatibility: it resolves two bugs, which made the game crash under Windows Vista. Additionally EA suggests to install the patch, if you want to play in onlinemode. The World Cyber Games (http://www.worldcybergames.com | www.worldcybergames.com/usa), the worldâ€™s largest computer and video game festival, has selected Need for Speed: Carbon as one of its Official Games for 2007. Registration for the WCG is currently open to all players and online qualifiers begin shortly. The road to the WCG Grand Final, video gamingâ€™s premier global tournament, begins now. Click here to register or click the banner below. Race Nights is a weekly event starting at 9 EST / 6 Pacific Time every Friday that will be devoted to one console every week. You can read more about it here or read below. Hey guys, I just wanted to introduce a new community weekly event that will/should bring all NFS: Carbon players together one night a week to compete, have fun, and try to earn the EA Moderator achievement! RACE NIGHTS is a weekly event starting at 9EST / 6 Pacific time every Friday that will be devoted to one console every week. Come race on Friday, and then report about your experience in this thread, and your place, times, and other statistics will be reported on the main website and this forum! Opportunities for prizes may come as well, but this is your chance to declare at least one day a week yours! So put the women and children to bed guys, and meet me and other NFS enthusiasts online Friday night, 9 EST time. The first NFS:C ladder has been opened on clanbase.com, and players around the whole world are welcome. While setting up the ladder we kept a keen eye on the maplist. Finally, we came up with a list that consists of the full maplist of one of the biggest European LAN events (SEC has Qualifiers in 40 countries), almost all of The Fast and the Furious Cup tracks and three other popular circuits. Collision detection and disabling nitro are ways in which we can avoid cheating and make it as huge as possible. All of the cars of the standard version are allowed. EA released patch 1.3 for Need For Speed: Carbon. The following issues where addressed. You can download the patch from the following links below. For those of you who didnt notice. The Need For Speed Carbon Showroom is now open. You can find it on your left under the NFS: Carbon link. Anyone interested making this baby? I requested it long time ago but i dont see anything.